Today, we will review negative in Past Perfect Tense. If you need more help on this, please go back to Lesson 50. Please follow the examples and finish the job. Have fun! I had not gone to Brazil. من به برزیل نرفته بودم. You (singular) had not gone to Brazil. He had not gone to Brazil. She had not gone to Brazil. We had not gone to Brazil. 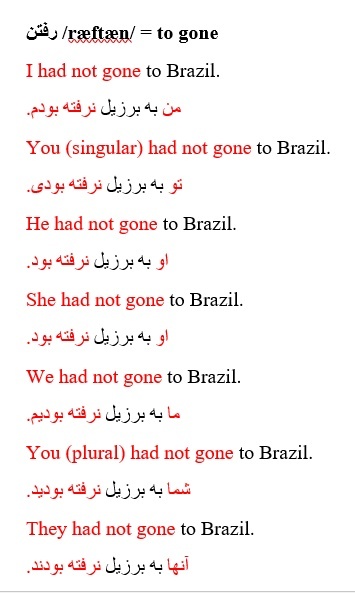 You (plural) had not gone to Brazil. They had not gone to Brazil. I had not eaten lunch. You (singular) had not eaten lunch. He had not eaten lunch. She had not eaten lunch. We had not eaten lunch. 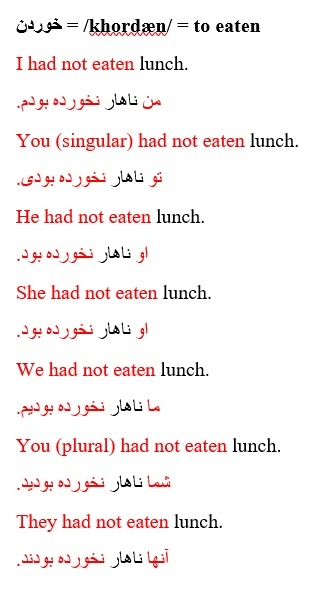 You (plural) had not eaten lunch. They had not eaten lunch. I had not listened to the radio. من به رادیو گوش نکرده بودم. 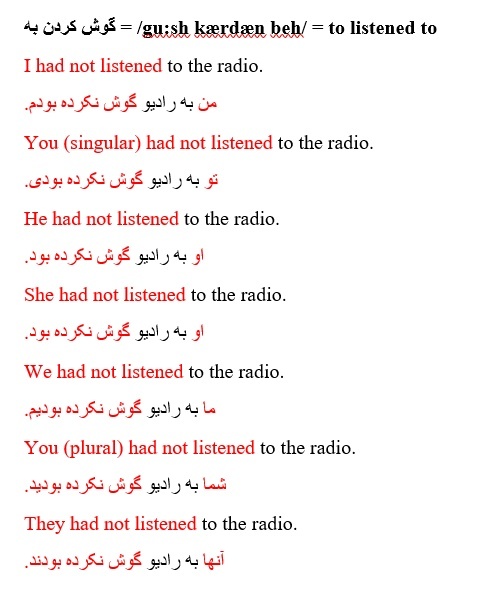 You (singular) had not listened to the radio. He had not listened to the radio. She had not listened to the radio. We had not listened to the radio. You (plural) had not listened to the radio. They had not listened to the radio. I had not seen your friend. من دوستت را ندیده بودم. 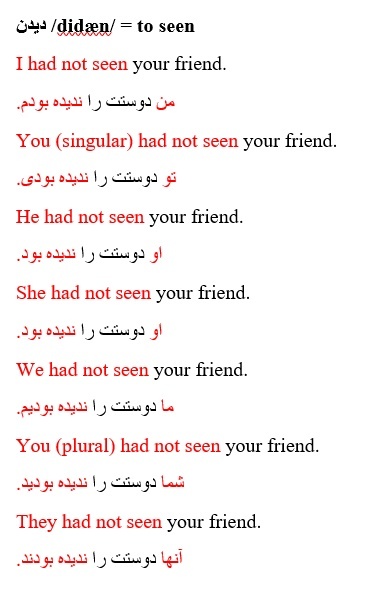 You (singular) had not seen your friend. He had not seen your friend. She had not seen your friend. We had not seen your friend. 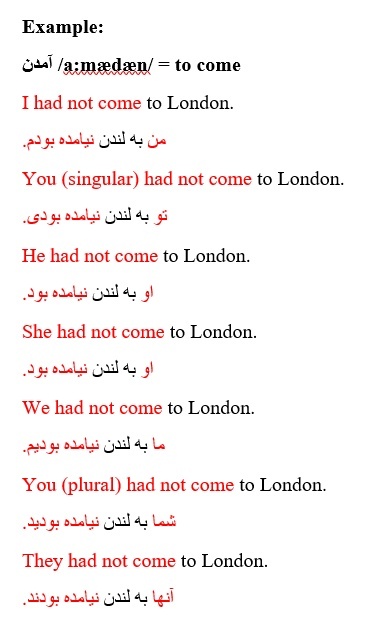 You (plural) had not seen your friend. They had not seen your friend. I had not read a book. 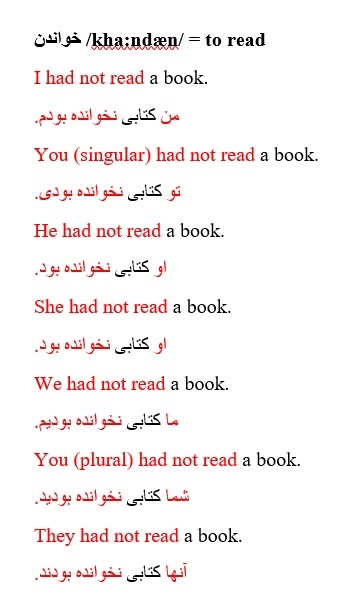 You (singular) had not read a book. He had not read a book. She had not read a book. We had not read a book. You (plural) had not read a book. They had not read a book. من نامه ای ننوشته بودم. 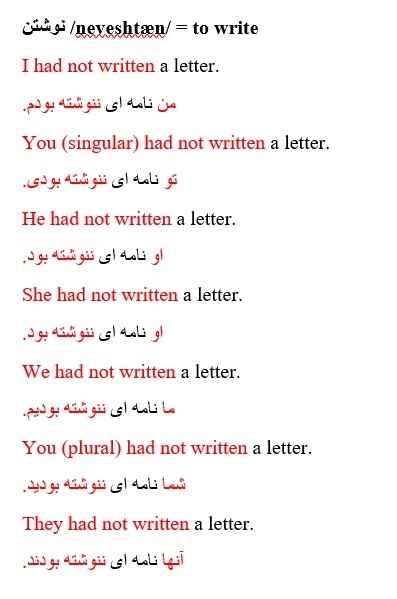 You (singular) had not written a letter. She had not written a letter. We had not written a letter. You (plural) had not written a letter. They had not written a letter. I had not cleaned my car. من ماشینم را تمیز نکرده بودم. You (singular) had not cleaned my car. He had not cleaned my car. She had not cleaned my car. We had not cleaned my car. 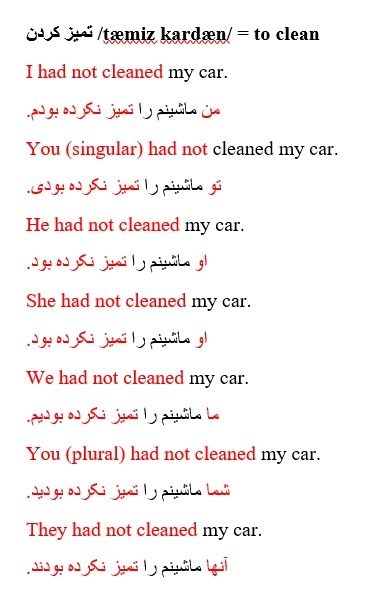 You (plural) had not cleaned my car. They had not cleaned my car. I had not sold my house. من خانه ام را نفروخته بودم. You (singular) had not sold my house. He had not sold my house. She had not sold my house. We had not sold my house. 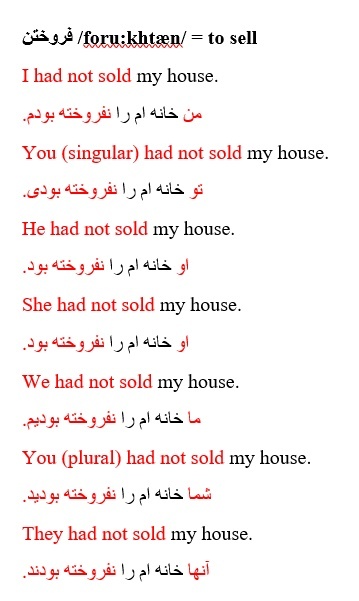 You (plural) had not sold my house. They had not sold my house. I had not washed the dishes. من ظرف ها را نشسته بودم. You (singular) had not washed the dishes. He had not washed the dishes. She had not washed the dishes. We had not washed the dishes. 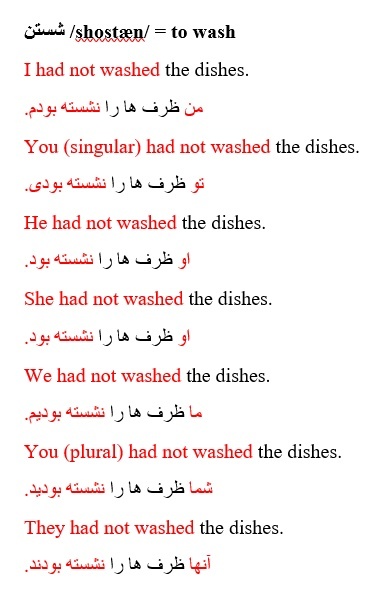 You (plural) had not washed the dishes. They had not washed the dishes. I had not bought a car. You (singular) had not bought a car. He had not bought a car. She had not bought a car. We had not bought a car. 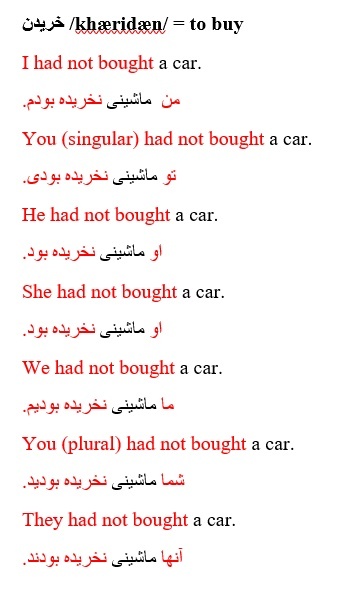 You (plural) had not bought a car. They had not bought a car.